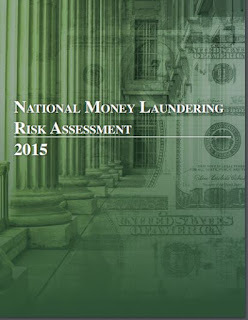 CyberCrime & Doing Time: Money Laundering and Counter-Terrorist Financing: What is FATF? Money Laundering and Counter-Terrorist Financing: What is FATF? Many cybercrime investigators seem narrowly focused on the bits and bytes of the crimes they investigate while not truly understanding or interacting with those who focus on where the money goes. As we've been expanding our horizons, I've learned quite a bit and wanted to share some resources for others who may have been similarly limited in their focus. The Financial Action Task Force (FATF) was established in 1989. It built a list of Forty Recommendations for countries to address Money Laundering, which were first issued in 1990, and revised in 1996, 2001, 2003, and 2012. Their latest FATF Annual Report (2017-2018) addresses Terrorist financing as well as new methods and trends and announces a research project on financing of recruitment for terrorism. Many of these Recommendations meet our lives in the form of regulations on financial institutions and interactions between international law enforcement agencies. "Regardless of their size and complexity, the financial activities and channels of terrorists are an essential source of intelligence. Financial investigation can identify terrorist cells, their associates and facilitators, and reveal the structure of terrorist groups, and their logistics and facilitation networks." -- FATF President Santiago Otamendi, 14DEC2017, NYC. 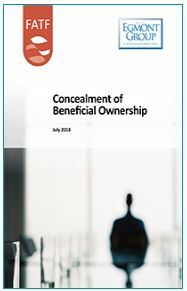 FATF also released an important report "Financing of Recruitment for Terrorist Purposes" in January 2018, and a second report "Concealment of Beneficial Ownership" in July 2018. FATF is composed of 38 member states, covering most of the major financial centers of the world. Each of these member states has pledged to come into compliance with the Forty Recommendations, and to measure its progress. In this chart, each member state, including the Associate members, is ranked on how well they comply with each of the 11 "Immediate Outcomes" and 40 Recommendations. For example, the United States is currently not compliant with recommendations 22, 23, and 24 -- so, we don't do well in non-financial institutions, and our shell company games are impossible to monitor as of now, but we do generally do well in most others. Clicking the "4th Round Ratings" label will take you to the full chart. If you do international business, it may be a form of risk doing businesses in countries with poor ratings across the board here. Each member is encouraged to perform regular assessments to measure themselves on how they are complying with the Forty Recommendations. Here are example reports from the United States, but these reports are available for every country that participates in FATF or one of the Associate Members. 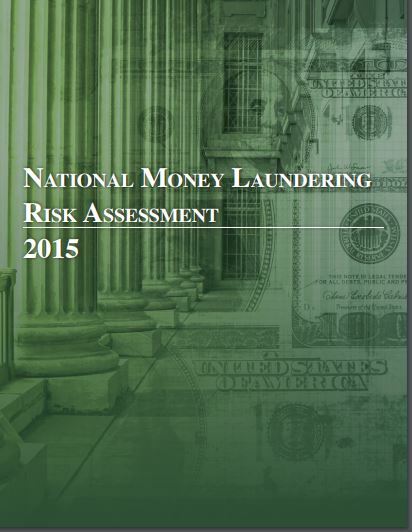 In the United States, these assessments are published by the Department of the Treasury. 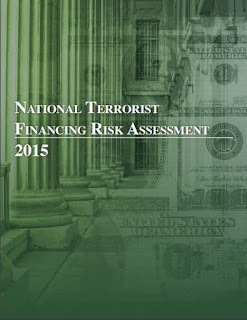 These reports were issued in 2015 by the Treasury Undersecretary for Terrorism and Financial Intelligence, Adam Szubin. The goal of sharing these examples is to serve as a reminder that from the FATF site, ALL such reports for all member states are available, by looking for the "Mutual Evalutions Publications." As of this writing the four newest ones are from Tunisia, Nicaragua, Panama, and Tajikistan. FATF also has 9 Regional Bodies, considered "FATF Associate Members" each of which put out specialized information for their portion of the world. For those who are interested in that Region, following up on those specific regions reports from their representative task forces and groups will be worthwhile. One activity of interest here is that each country is being reviewed by the other members in "Mutual Evaluation Reports" for how they are doing complying with the FATF Forty Recommendations. All of the member countries went through the first round of the process, with published reports, between 2007 and 2012. Tunisia, Bahrain, Saudi Arabia, and Mauritania have completed the process as of this writing. The Committee of Experts on the Evaluation of Anti-Money Laundering Measures (MONEYVAL) covers most of Eastern Europe. Several more recent reports would be especially interesting regarding terrorist financing, stemming from an emergency meeting of 55 states, the United Nations, the Egmont Group of Financial Intelligence Units, the International Monetary Fund, the World Bank, and others specifically to address curbing the financing of ISIS/ISIL. There have also been significant regional reports issued by sub-groups and associate members. The Counter-Terrorism Financing Summit, hosted by Australia's Financial Intelligence Agency (AUSTRAC) and the Indonesian counterpart, Pusat Pelaporan dan Analisis Transaksi Keuangan (PPATK), issued the Regional Risk Assessment on Terrorism Financing 2016. The following year, the event was repeated, adding Bank Negara Malaysia as a partner. These events issued two small statements, and one more substantial report, addressing events in Philippines, Thailand, Malaysia, Singapore, Indonesia, and Australia, and how those events were funded. In the Paris meeting 19OCT2018, a special issue that was raised was the Regulation of Virtual Currencies. This was deemed to be a matter of strategic interest that will be further evaluated, especially with regard to Initial Coin Offerings and their role in Money Laundering. 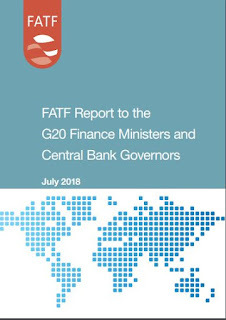 FATF has committed to work with the G20 to come up with new guidelines to update their previous report "Virtual Currencies: Key Definitions and Potential AML/CFT Risks" as well as their report "Guidance for a Risk-based Approach to Virtual Currencies" (June 2015 - 46 page PDF). "Noting that virtual currencies/crypto-assets raise issues with respect to money laundering and terrorist financing, they committed to implement the FATF Standards as they apply to virtual currencies/crypto-assets. They looked forward to the FATF review of those Standards, called on the FATF to advance global implementation, and asked the FATF to provide an update on this work in July 2018. The FATF will take this work forward under the US presidency from 1 July 2018 to 30 June 2019." This work begins with first reviewing laws and regulations regarding crypto-assets and virtual currencies in each of the G20 states. More on this topic will certainly be forth-coming from FATF.